Wheelchair footrest hangers are generally static. If the client is able to extend at the knees, the feet move forward off the footplates. This is fine for clients who can easily move their foot back onto the footplate. If the client’s feet tend to leave the footplates and the client cannot return to this starting position, we often add in foot straps and/or shoeholders to maintain this position. Why is it important for the foot to be in contact with the footplate in the first place? The footplate protects the foot from injury, provides weight-bearing (distributing weight along the buttocks, posterior thighs, and soles of the feet), and provides stability for functional tasks. Flexion tends to break up extensor tone, and so the knees are often flexed and strapped to the footplates to maintain that flexion. However, many clients will continue to extend against this static solution. Dynamic components allow knee extension, absorb and diffuse force, and then facilitate a return to a starting position. This can break up extension more effectively and may be better tolerated by the client. Significant forces can lead to pain and even injury of the lower extremity joints, particularly the knees and ankles. One client I know ruptured both patellar tendons extending in his static seating system and wheelchair. He now uses dynamic footrests and his knees are no longer red and swollen. Significant forces can also lead to the footplates being “pushed” out of alignment and even cause damage to the footrest hanger assembly. Dynamic components diffuse this force, protecting the frame from damage. So, movement at the knee can meet these 3 goals, as well as others. 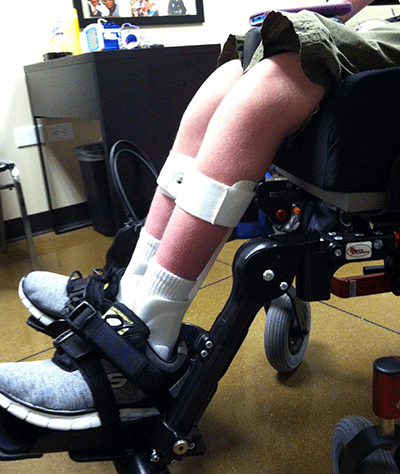 Dynamic Footrests can be placed on most manual and power wheelchair frames. Practical, succinct and helpful tips for wheelchair seating & positioning practitioners. Thanks Michelle! Thanks so much for reading the blogs, Joan! And thanks for all you do for the clients you serve!